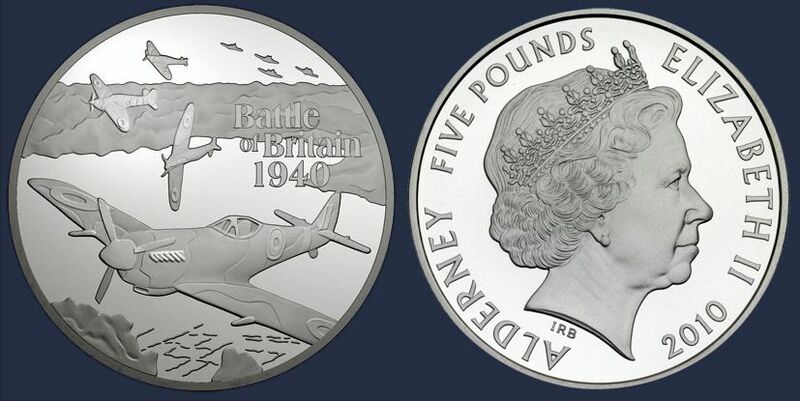 Commemorating the 70th Anniversary of the Battle of Britain, the Royal Mint issued a limited-edition £5 coin featuring the image of a Spitfire and a vic of Hurricanes. The front design has been made by artist Thomas Docherty, with the customary profile of HM The Queen at the reverse. Notably for any aviation buff, the featured Spitfire is a clipped-wing LF Mk. XVIe with a teardrop canopy – not quite a Battle of Britain machine! The coin is struck in silver and sold as a collectible item, in a presentation case with certificate of authenticity.